Home PAGASA DOST-PAGASA: GALE WARNING Update as of 4:00 PM 19 January 2019. DOST-PAGASA: GALE WARNING Update as of 4:00 PM 19 January 2019. Issued at: 4:00 PM 19 January 2019 - STRONG TO GALE FORCE WINDS ASSOCIATED WITH THE SURGE OF THE NORTHEAST MONSOON. 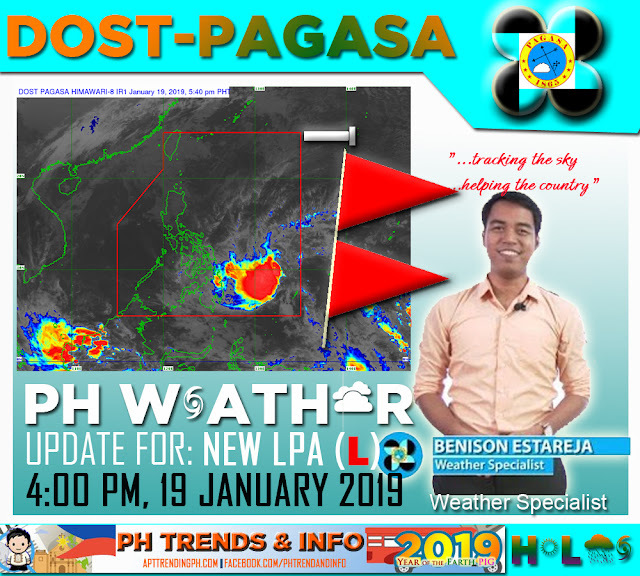 Synopsis: At 3:00 PM today, the Low Pressure Area (LPA) was estimated based on all available data at 600 km East Southeast of Hinatuan, Surigao del Sur (7.0 N, 131.6 E). Northeast Monsoon affecting Luzon and Visayas. THE EASTERN SEABOARD OF VISAYAS AND MINDANAO (Northern Samar, Eastern Samar, Dinagat, Surigao del Norte Including Siargao Island, Surigao del Sur, and Eastern coast of Davao Oriental) will experience Cloudy skies with scattered rainshowers and isolated thunderstorms. THE NORTHERN AND EASTERN SEABOARDS OF NORTHERN LUZON(Batanes, Calayan, Babuyan, Cagayan, Isabela, and Northern coast of Ilocos Norte) will experience Cloudy skies with light rains. THE EASTERN SEABOARD OF CENTRAL AND SOUTHERN LUZON (Aurora, Eastern coast of Quezon including Polilio Island, Camarines Provinces, Catanduanes, Eastern coast of Albay, and Eastern coast of Sorsogon) will experience Partly cloudy to cloudy skies with light rains. Fishing boats and other small seacrafts are advised not to venture out into the sea while larger sea vessels are alerted against big waves.